I am so thankful for the time I got to spend with all of you, volunteers, staff, horses, and clients; your open hearts and welcoming personalities made it easier to be apart from my family because I had been adopted into a new one. I know my lack of experience with horses and my short time in New Mexico may have made it difficult to not only train me, but also trust me and possibly find me as useful as your typical volunteers. I can only hope that I was as helpful to you all as you all were to both my future career and me. I have two small and fairly simple requests that I hope you can fulfill for me if you deem them appropriate (this is mainly directed toward the second request). Please give Kodi, Cisco, Sonic, Whiskers, Fly, and Tosca, even though I never got the opportunity to meet her, all my love. I took a bunch of selfies with Kodi, Cisco, Sonic, and Whiskers and created a collage canvas that I plan on hanging in my college dorm room; I also plan on bragging about my favorite boys whenever someone sees the canvas in my room. The second request I have is for you to share these little notes with the specific people I have written them for. While I do not know if the people I have written these notes for will remember me, writing these little notes help me feel as if I have fully completed the job I set out to do when I arrived in New Mexico. Carol: Despite what you may think, you are an excellent rider; you just have to remember to be patient with yourself and your horse. And if you don’t feel confident one day, fake it until you make it because I can guarantee you’ll make it. Sit tall and with confidence. Who knows? There may be a doughnut in your future. Hans: Sometimes you forget to believe in yourself, and that’s okay because you have Ashley telling you how great you’re doing until you begin to believe it yourself. You call yourself old, but I can tell you have a young spirit at heart and that’s all that truly matters in the end. Thomas (can be given to his Mom): There is something about your personality that just draws people and horses in; maybe it’s your optimism or smile or your charm or laugh. Whatever it is, don’t lose it. I am so glad we got a picture together so I can remember the laughs I had when you were around me. I will most definitely be missing your smile and your flirtatious nature. Rae: You have the best horse shirts and socks I have ever seen; I am disappointed that I can’t see more of your collection. You are funny and kind; I can’t remember ever feeling down around you because your smile and laugh is so contagious. You are also an excellent rider no matter which horse you ride: Cisco or Fly. I can’t wait to see what pictures Ashley takes of you while riding. Nancy: You were my mom away from my mom; you reminded me to put sunscreen on, eat, drink water- everything that my mom would’ve reminded if she were with me. I know that she and I are both thankful for your reminders. Thank you for spoiling me with ice and caring for me. Indie: Good luck in Pony Club this year; you’ll be amazing! Don’t grow up too fast- keep jumping in puddles and spraying the ceiling of the barn to make it rain. That being said, try not to spray too many people with the hose and be careful when climbing or sitting on anything in the barn. Be careful, be safe, and have tons of fun. Hannah: All of the horses at the barn love you and the attention you give them, which is extremely rare and amazing. I’m sorry I had to leave our 18 year olds only club so soon, but I know that you and Fly will both be 18 for a little while longer to carry on the club. Be confident and don’t forget to smile! Denise: I cannot tell you how much I appreciated your advice and wisdom during these past few weeks, especially your advice and wisdom about the Peace Corps and college. I will be definitely looking into the possibility of joining after I graduate college. I also plan on keeping you updated on how things are going during the school year. I also cannot express how grateful I am that you offered to write me a character reference- I may take you up on that. 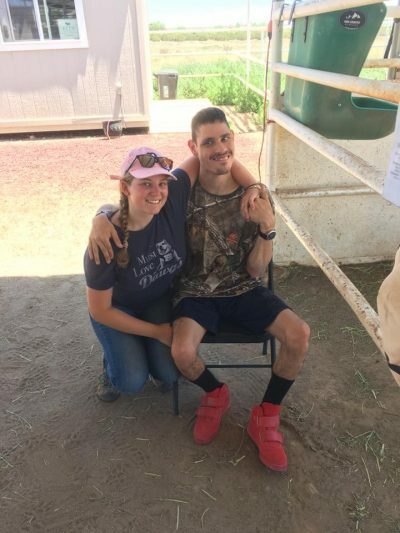 Ashley: I arrived at the barn with very little horse experience and left with more knowledge about horses than I could’ve expected to leave with, thanks to your mentoring. I would’ve never guessed that people would be asking me questions about horses, and possibly more surprisingly- that I would know the answers to the questions. I cannot fully express how thankful I am for these past few weeks under your wing because while my horse knowledge grew exponentially, my knowledge about people did as well. Good luck with your future competitions with Eli- you guys will be amazing. I do not yet know where I will be next summer or what I will be doing, but I can only hope it will be working with you all again or following another dream/passion of mine. I look forward to the Facebook updates, so please post often (for my sake! ).